TH E M R EP O RT | 5 MTECH The process works by automati- cally analyzing data obtained from loans which are originated using OpenClose's LOS system and send- ing that data directly to MCT. The companies noted that the data can be updated every 15 minutes, pro- viding a seamless data acquisition process, which is faster and more accurate than current processes. "We worked diligently with the team at OpenClose to develop this connectivity between their LOS and our proprietary HALO hedg - ing model, which now facilitates a much smoother, quicker way for us to obtain locked loan informa- tion from our mutual customers," stated MCT Chief Administration Officer Chris Anderson. "We are continuing to expand our integra - tion partner network in order to provide the best service and sup- port for our lender clients." The process reduces the lender's exposure to risk by shortening the timeframe in which the lender can respond to rate shifts, which are more likely to occur over longer periods of time. The system has received positive feedback thus far. "This integration saves my staff valuable time and transfers our data quickly and securely, ensuring that my hedge positions are always opti - mized," stated Dan Beam, SVP of Capital Markets at Firstrust Bank. CoreLogic Announces RealQuest Mobile App THE NEW APP FOR REAL ESTATE PROFESSIONALS DELIVERS A WEALTH OF PROPERTY INFORMATION ON MOBILE DEVICES. C oreLogic announced the in- troduction of the RealQuest mobile app, which allows real estate and mortgage profes- sionals to access pertinent property information while on the go. According to a company press release, the RealQuest App incor - porates multiple functionalities, including the ability to search by property address, owner name, or map; identify all properties associated with an owner; check foreclosure status; validate property value; confirm property owner - ship; research property transaction history; and compare sales that are in the surrounding area. The app is available for iOS users, and to access the features, mortgage and real estate professionals must be subscribed to the New RealQuest. "Purchase originations are be - ing forecasted to reach more than $1 trillion this year, with one in three new mortgages expected to be made to millennials. Given the growth of millennial household formation and their technology preferences, it's critical for mortgage professionals, real estate agents, appraisers and investors to have cutting-edge, on-the-go technol - ogy that gives them a competitive edge," said Shaleen Khatod, SVP of Data Solutions at CoreLogic. "With the RealQuest App, they can access national property, owner and mortgage data and insights that will help them seize more opportunities whenever and wherever they are." Qualia Adds Custom Reporting to Title Settlement System THE NEW REPORTING TOOL FROM QUALIA ALLOWS TITLE AND CLOSING PROFESSIONALS TO MAINTAIN AND ANALYZE THEIR BUSINESS CONTACTS. T itle settlement software Qualia announced the release of its advanced reporting module. The reporting equips title and closing profes- sionals with a customizable tool to analyze revenue sources, business relationships, and op- erational efficiency. "From our team's background building small and large agen- cies, we know the challenge of maintaining and growing relation- ships with lenders and realtors while guaranteeing the right level of quality," Nate Baker, CEO of Qualia said. "We built Qualia Reports to solve that problem." Within the "Reports" tab, Qualia users can access and create custom reports based on tasks, contacts, and any other data involved in the settlement transac- tion. The flexibility of custom reporting allows users to answer bigger questions about their busi- ness pipeline, while also identify- ing ways to streamline day-to-day operations. Because all the data is already housed in Qualia, reports are automatically generated and available to users at no additional cost. Additionally, Qualia uses arti- ficial intelligence to immediately detect and notify users when they enter a contact record that is simi- lar to a pre-existing record. "Most title agencies have to manually merge duplicate contacts every month; it's extremely time- consuming and prone to errors. Because Qualia automatically merges duplicate contacts, agents can finally get a simple and fast answer to what business sources are their main revenue drivers and how those sources are trending month-over-month," Baker said. Mortgage Insurance More Accessible Through PathSoftware USERS OF CALYXSOFTWARE'S PATHSOFTWARE CAN NOW REVIEW MGIC RATE QUOTES AND ORDER MORTGAGE INSURANCE WITHOUT LEAVING THE PATHSOFTWARE SYSTEM. C alyxSoftware announced in late January its mort- gage loan origination software, PathSoftware, is inte- grating with Mortgage Guaranty Insurance Corporation (MGIC). 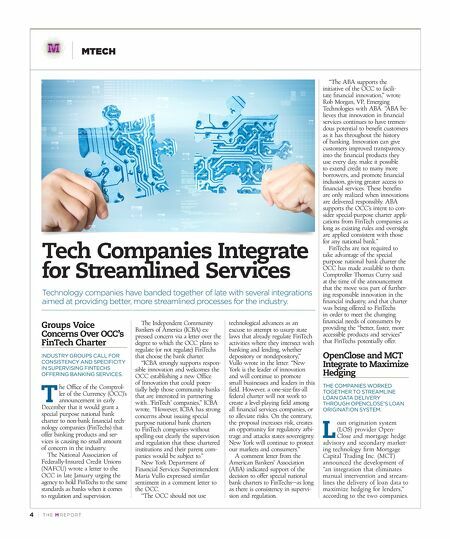 This integration allows for two-way communication and secure data exchange between PathSoftware and MGIC. PathSoftware customers can now obtain MGIC rate quotes and order mortgage insurance without leav - ing their loan file. The integration also auto-populates the appropriate mortgage insurance premium fields back into the loan file without leav - ing Path, decreasing data entry time and increasing accuracy. "Our integration with CalyxSoftware addresses the growing demand for automa - tion in the loan origination process," Margaret Crowley, VP of Marketing and Customer Experience at MGIC, said. "This partnership further illustrates our commitment to providing best-in- class customer experiences." Doug Mitchell, Director of Sales and Support at PathSoftware, expressed his approval of the in - tegration. 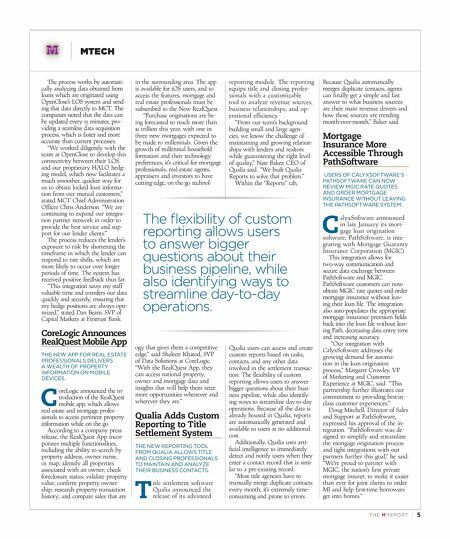 "PathSoftware was de- signed to simplify and streamline the mortgage origination process and tight integrations with our partners further this goal," he said. "We're proud to partner with MGIC, the nation's first private mortgage insurer, to make it easier than ever for joint clients to order MI and help first-time borrowers get into homes." The flexibility of custom reporting allows users to answer bigger questions about their business pipeline, while also identifying ways to streamline day-to-day operations.